Now Your Hands May Not Tell Your Age! Home/ Now Your Hands May Not Tell Your Age! 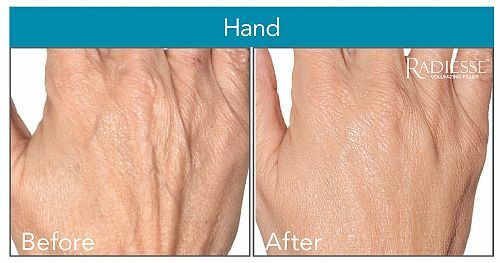 Treatment for Aging Hands – Radiesse has been FDA approved for hand augmentation to treat loss of volume in hands. Radiesse injections can rapidly re-plump and replenish volume to the back of the hands to possibly provide a supple and youthful appearance . Placed beneath the skin, Radiesse raises the skin level so that tendons, joints and veins may lose their prominence. Radiesse can provide quick and durable results. Results can possibly last 1 – 2 years. Radiesse does not require allergy testing. Radiesse is a safe, effective and non-surgical treatment, which can provides rapid smoothing of wrinkles, scars and the replenishment of volume loss.